NOTE: KeyServer is only found on laptops year 2016 or older. Any re-imaged laptop will not have KeyServer and can instead use VPN to connect. Correct KeyServer Address on a Windows-based computer. The computer must have an active on-campus or VPN connection. 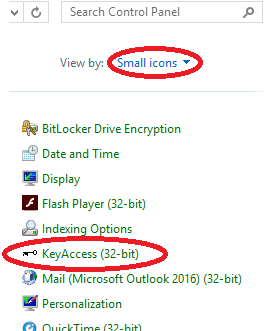 Launch KeyAccess from within Control Panel (you may need to change to "small icons" as shown). Verify that the "KeyServer Address" is keyserver.uwstout.edu as in the example below. To correct an erroneous address, enter keyserver.uwstout.edu and click the Logon button. If successful, the KA-500 message will pop-up confirming that the connection to KeyServer was successful. Click OK, close all open windows, and launch the desired application.